How often do you wonder about something? I don’t mean to be curious but instead to marvel. As many middle-aged women do, last night I woke up at 2:30 with my mind thinking about all kinds of things. As I lay in my bed wishing for a few more hours of sleep, I began to wonder about something. Earlier that evening I had seen a TV advertisement for 23 and Me Genetic Testing and Analysis. I guess this might have spurred my thought process, but really it could have been the left-over Mexican food I had for dinner. At any rate I began to wonder or marvel about my conception. Yes, I do know where babies come from and am sure of my parentage, but this marveling is a story I’d like to share. My mother has a keloid scar on the lower portion of her neck. As a kid, I remember her choosing her necklines and necklaces carefully to bring as little notice to this flaw. I also remember her explaining to me how she got the scar. In 1949 at the age of three, she came down with diphtheria, a disease that we have almost eradicated through DTP vaccinations. The disease caused a very thick mucus to form in her throat hampering her breathing. She was transported by ambulance to Grady Hospital and was given a tracheotomy to allow her to breathe. The wound from this formed the unique scar on her neck. In the middle of the night I wondered at the fact that she survived such a rare illness and that she reached the hospital in time, for without her I would not be me. Not many people know about their parent’s close call with death. I grew up knowing this tale along with another one about my father. When my dad was finishing high school about to enter college, one night he was doing what many his age did – riding around with friends on a dark, curvy, country road. The driver of the car lost control on a sharp curve sailing off into a tree. This was 1960, long before the time of seatbelts. One of his friends was badly injured and my daddy, who was tossed out of the car, was walking around and thought he was fine. The emergency workers noticed that he had blood coming out of his ears and said to the ambulance driver, “You better take him to the hospital as well.” There, at Newnan Hospital, they discovered he had a severely broken shoulder and a head injury. He was in a coma for a while. In those days there was little that could be done for a head trauma except to wait and see if the bleeding and swelling would stop and if it did, wait to see how much damage it had done. He did recover with very few signs of his head injury, although he would tell you that his short-term memory was better before, and his shoulder has never been the same since. In the middle of the night as I pondered these things, I was filled with a sense of providence and the thoughts of that made the scripture Jeremiah 1:5 more real than before. It reads: “I knew you before I formed you in your mother’s womb. Before you were born I set you apart…” NLT. The 23 and Me people would certainly argue that without the unique combination of my mother and father’s DNA, I would not be me. My unique flaws and giftings, the mixture of mess and majesty that I am, was divinely provided for through the preservation of a sick, little three-year-old girl and a teen in a coma. Other people might see it differently. Some might say it was just fate. I would rather sit in wonder of a grand creator that cared enough about me even before I was born to form my DNA as He intended. 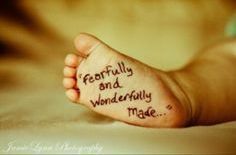 I prefer to believe that as Psalm 139: 14 says, “I am fearfully and wonderfully made” – a thought appreciated much more with middle-aged insomnia.